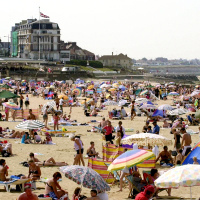 One third of holidaying families will opt for a British break this year, new research suggests. According to a survey by holiday rental firm HomeAway, 35% of UK families are more likely to have a staycation in 2017 than they were last year. For overall holidaymakers, around a fifth will be opting for a UK break. The figure has been attributed to the uncertain economic climate in Britain as a result of June's decision to leave the EU. A survey shortly after the referendum showed 70% of Brits had no intention of cutting their holiday budget. However, the pound's sharp decline - falling 10% against the euro and 18% against the dollar - has inevitably made holidays abroad more expensive. Marcello Mastioni, HomeAway's vice president, said: "In relation to the weakening of the pound, we've actually seen a trend of people spending more of their vacations domestically in the UK." Anyone planning a staycation can take out cancellation insurance for UK breaks for added peace of mind. According to the survey, south western England - identified as the West Country - is a more preferable choice for holidays than the capital. "London is more of a destination for maybe extended long weekends," Mr Mastioni said. "But if you're thinking about an alternative to an international destination for say, summer holidays, then you would consider other domestic destinations such as Cornwall, Devon, Yorkshire, Cumbria and so on."